Sioux Center, Iowa. Most Republican members of the U.S. Senate have signed a public letter to the Iranian government warning that any agreement with President Obama that is not approved by the Senate is likely to be transitory and counterproductive for all concerned. Under the pretense of helpfully schooling the Iranians on the American constitutional system, the letter is really designed to embarrass President Obama and hinder negotiations between the U.S. and Iran over possible nuclear weapon proliferation. The letter has attracted a lot of attention. Is it unprecedented? Is it treasonous? Does it repudiate the post-World War II tradition of partisanship stopping at the water’s edge? It is not unprecedented. During the George W. Bush years, Speaker of the House Nancy Pelosi met with Syrian government officials at a time when the President was seeking to geopolitically isolate the Assad regime. Many Republicans–including Fox News pundits–were outraged by her foray into international affairs while many Democrats defended it. Prior to the Iraq War in 2002-03, some Democratic members of Congress travelled to Iraq on a peace mission. Again, the response mostly fell along predictable partisan and ideological lines. It is not treasonous. Treason is not about questioning or disagreeing with the President. National media which are sympathetic to Obama decry the impropriety of undercutting the Commander in Chief. But Obama is not the Commander in Chief of Congress . . . or of the American people. This is a specific title referring to chain of command for enlisted military personnel. Constitutionally, the President was never intended to be a national dictator. Over the years, especially during the past century, Congress has unconstitutionally and unwisely abrogated many of its powers to the Executive Branch (including the war-making power). This has led to an imperial presidency that works against both constitutional balance and popular sovereignty. On the surface, the GOP letter to Iran seems to be concerned about executive overreaching by Obama. 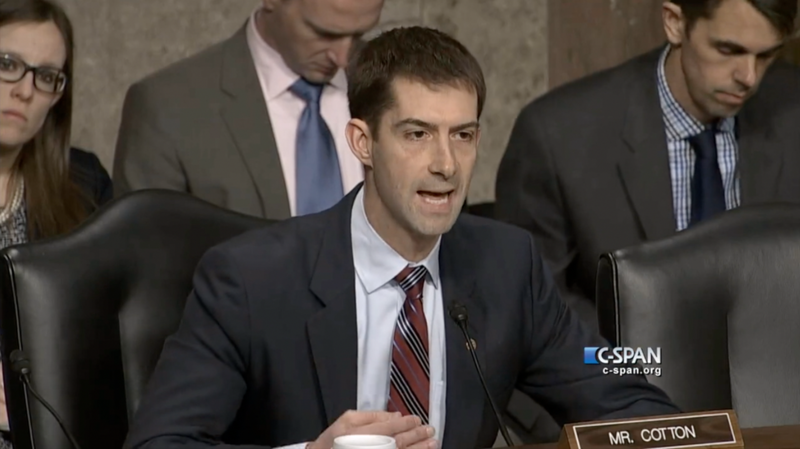 But its main author, Senator Cotton, freely admits that the real intent of the letter is to damage prospects for an agreement with Iran. It is not a serious constitutional argument. Most Republicans in D.C. have no qualms about executive agreements per se. Bush and previous presidents routinely relied on them even though the practice is nowhere to be found in the Constitution. Unfortunately, the Supreme Court has granted Presidents the power to negotiate agreements with foreign powers without Senate consultation and consent. Along with executive orders and executive privilege (two other extra-constitutional powers), this has helped to put many executive actions beyond the authority of legislators. But Republican legislators are not really concerned about executive overreach. When their party does it, they don’t complain. So there is hyperbole and nonsense on both sides of the aisle. Indignation over Obama’s methods is feigned. Accusations of treason are silly. If there is treason to be found, it is not because the President’s near-monopoly on foreign policy is being challenged by a theoretically co-equal branch of government. Conservative grassroots Republicans, who take their principles far more seriously than do most of their elected representatives in Washington, might think that Obama is guilty of treason for “cozying up” to the Iranians. And yet, realistically speaking, Iran is no threat and no rival to the U.S. government or the American people. It is, however, a rival and possible threat to Israel. Why are so many GOP members of Congress fixated on the interests of a foreign government? What is it about Israel that sparks such a sacrosanct, near-unanimous party line? That produced standing ovation after standing ovation for Netanyahu when he addressed Congress? These are interesting and rarely-discussed questions. Emotional attachment and political loyalty to a foreign power could itself be interpreted by some as a form of treason (depending on how American patriotism is defined). Very few Republican politicians have a Jewish ethnic or Judaistic religious bond to Israel. In their case, it seems to stem from two different concerns: friendship with what President Eisenhower called the military-industrial complex and belief in a global empire (“Pax Americana”) that makes use of enormous military might. When you create an empire you shouldn’t be surprised when the nation’s executive acts like an emperor. The old republic is long gone, as are its quaint traditions. This is one reason that the neoconservatism of Republican globalists is not genuinely conservative; it is Wilson-FDR-Humphrey liberalism under the guise of GOP conservatism. Israel plays an important role as a geopolitical ally in the Middle East as the federal government attempts to police the world. Given their political, economic, and military interests, GOP politicians naturally gravitate toward hawkish, hardline Israeli governments. In addition, AIPAC and other American interest groups supporting such Israeli politicians are generous with monetary carrots and sticks. Money influences politics and foreign policy is no exception . . . whether it comes from partisans of foreign governments or CEOs of military contractors. In this milieu, peace and security are rarely desired outcomes. Fear and insecurity work better. To put it simply, war and preparations for war make money. Peace is not lucrative. Eisenhower, a Republican who had previously been a U.S. Army five-star general and NATO supreme commander, explained it well in his 1953 and 1961 speeches. Jesus may have blessed the meek and the peace-makers, but it is the strong and the war-makers who are in the driver’s seat of the present world order. To add one more disheartening element to a discouraging context, we have to admit that simple partisanship–yet another means of trying to hurt Obama and the Democrats–is another major factor in the Republican senators’ letter to Iran. This wouldn’t be so bad if it were principled. For the most part, it isn’t. President Obama has done plenty of bad things but he is often attacked by GOP leaders for doing bad things that President Bush did earlier while they were silent or supportive. There is no consistency or idealism, just partisan jockeying and demagoguery. Of course, Democratic politicians tend to be no better when it comes to such matters. Two closing points. First: Serious debate about an agreement with Iran would be healthy. There is nothing wrong with disagreeing with a President or having partisan debates over foreign policy when human lives and important principles are at stake. Second: When the U.S. government enters into agreements with foreign nations, Senate approval should be required for implementation. Rule-makers should follow the foundational rules of the U.S. government. Sadly, neither the Senate under Mitch McConnell nor the White House under Barack Obama have much interest in honest debate or constitutional framework. Our nation, and the world, are in great need of Christians in Washington who know how the Machiavellian game is played but have retained their integrity, who are wise as serpents and innocent as doves. Note: This essay originally appeared on the Dordt College blog in all things. Jeff Taylor was born and raised in Spencer, Iowa. He is Professor of Political Science at Dordt College. He is author of three books: Where Did the Party Go? : William Jennings Bryan, Hubert Humphrey, and the Jeffersonian Legacy (University of Missouri Press), Politics on a Human Scale: The American Tradition of Decentralism (Lexington), and The Political World of Bob Dylan: Freedom and Justice, Power and Sin (Palgrave Macmillan). He has written for Green Horizon Quarterly, Modern Age, Chronicles, The American Conservative, FirstPrinciplesJournal.com, HuffingtonPost.com, LewRockwell.com, AntiWarLeague.com, and CounterPunch.org. He is roughly half German, a quarter English, and the rest is Irish, Scotch-Irish, and French. Jeff spent his entire life in the Midwest until moving to Alabama in 2008. He returned to his home state three years later. He has degrees from Northwestern College, University of Iowa, and University of Missouri. His research emphases are American politics, political theory, political history, and international relations. Jeff can be reached via email at wherego (at) aol.com. I am sorry, but it is. It is one thing for a Senator to meet with a foreign leader, even the leader of an enemy. It is another thing to put in writing to a head of state of an enemy that any agreement by the duly elected President of the United States is subject to abrogation and that negotiation for peace is pointless. Nancy Pelosi’s meeting with Assad might be compared to Congress’ invitation to Netanyahu to speak before Congress. But it was not an overt effort to undermine difficult negotiations over a peace treaty. Quite frankly, it is embarrassing — not to Obama (who will likely successfully conclude his negotiations with Iran within the next several weeks) — but to the reputation and standing of the United States in the international community. The article sadly but all too typically widely misses the mark on why exactly Israel enjoys such wide support among the American public. Note two words that are not present at all in this discussion–“democracy” or “terrorism”. As for the in/famous “letter”, no one old enough to have lived through the late Cold War can possibly honestly think there’s anything remotely “unprecedented” about it. The Dems spent most of the Reagan administration overtly opposing every single thing the President tried to do against communist governments everywhere. The uproar over it, and the despicable way that “treason” and “traitor” are being so casually thrown around, are infinitely more destructive to our national well-being. Personally, given the way that this president has trampled on congressional prerogatives in undeniably unprecedented ways, I couldn’t care less if some congresscretins decide to trample right back. Just because most politicians of both parties have their own reasons for meekly submitting to, when not openly pushing for, total executive branch supremacy, doesn’t mean we hicks from the sticks have to do so as well. Jim Wilton, you do realize, don’t you, that it wasn’t even a letter that was ever sent to anyone, right? It was an “open letter” posted on a website. How is that any different than if they had signed onto a blog post, or an op-ed? There isn’t anything remotely “embarassing” about elected representatives exercising democratic prerogatives. Tocqueville, since we don’t see eye to eye on this point, I will be content if you remember this conversation when we next have a Republican president. Somehow, I suspect that we will find ourselves on the same side in that situation. I can assure you that I will be as vehemently opposed to this type of behavior which undermines the credibility of the U.S. in the world community if done by Democrats as by Republicans.